I love the off the shoulder trend. It's flirty, cute and perfect for the summer heat. And all my favorite bloggers were sporting the cutest OTS tops. I was totally on board. Despite all the super cute options I couldn't find any that wouldn't slide up my shoulders when I moved even the tiniest inch. And since I'm so not broad across the shoulders they would always slide up around my neck and that just wasn't cute. So it looked like my journey for the perfect OTS was over before it even began. BUT have no fear friend this story has a happy ending! I was shopping with one of my best friends and we just decided to stop into Hollister. Yes Hollister the store I hadn't worn since like middle school. But we had time to kill so we popped in. We were browsing through the section reminscing on the days where it was only cool to wear items from Hollister when I spotted this beauty, basically in the dark, in the back. I scooped it up and headed to the fitting room. I wasn't hopeful just because of my many strikeouts with OTS dresses in the past but I tried it anyways. LOW AND BEHOLD it had sleeves and didn't just sit on my shoulders like the rest. Meaning I could move my arms without it sliding up! It was the miracle of the day! It's a shift style which is my favorite type of dress and has the cutest ruffle detail! 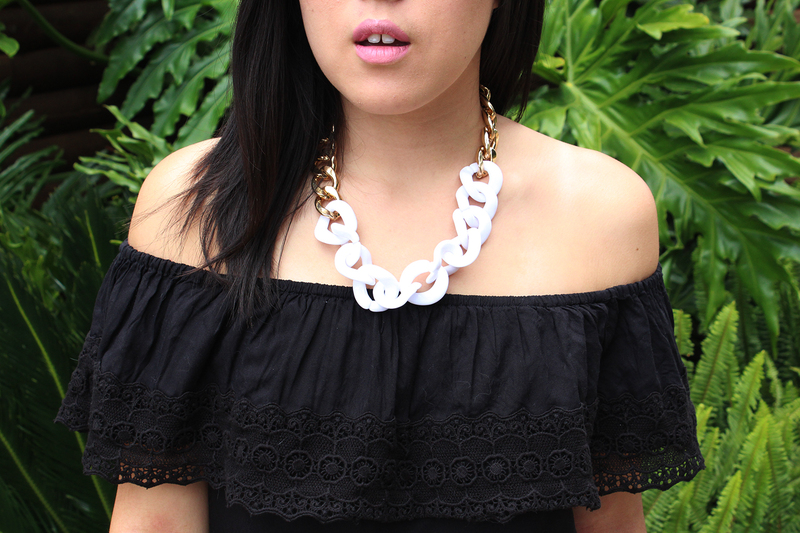 I never know what kind of jewelry to wear with necklines like this so I opted for pretty neutral statement necklace that was just the perfect length. This is such a great staple dress for summer. It can be worn to so many different functions from casual shopping and lunches, dinner, to a garden party, brunch, birthday, etc. Plus it's a LBD which is always in style! Every girl should have a casual LBD! These shoes are so fun for summer too! Sadly I can't find them online :( But I did link a similar pair below. I love pops of color, especially with black because the color is so vibrant! And the turquoise color looks so pretty against a tan. I can't wait to wear this dress out to any number of things! 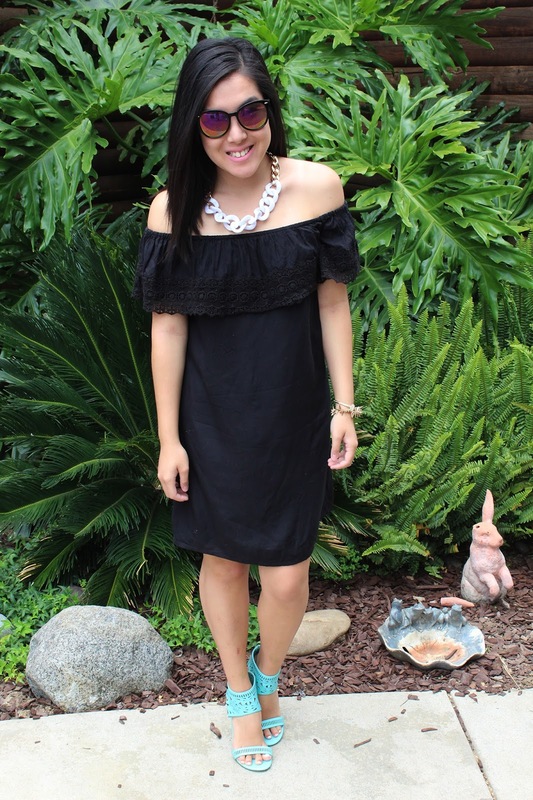 It's the perfect LBD for summer! I definitely love the OTS trend and want to find more tops and dresses that are like this one where it doesn't slide up to my neck. The search is on! Where do you get your off the shoulder tops/dresses? Have the same problem as me? Love or loathe the trend? Share your thoughts below! Hi, Samantha! I'm especially loving your shoes! Super cute! Thank you! They are so fun!